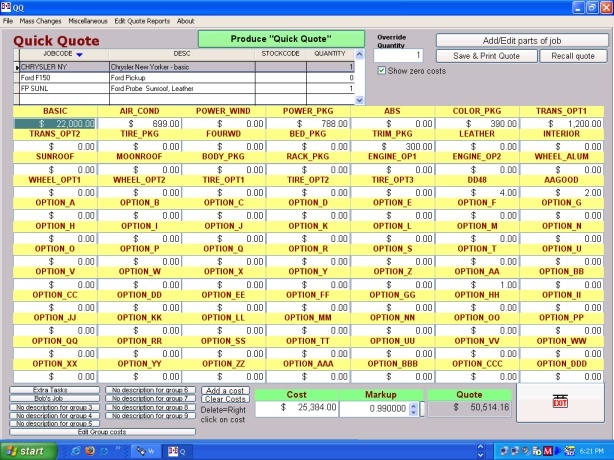 Quick Quote displays the costs (labor or parts/products) from a selected job record in a job file. Every job is comprised of different costs, either services or products/parts (or a combination). With one click, you can display up to 84 costs on the screen. Designed for easy production of customer quotes. Can produce quotes with one keystroke. Adjust markup %'s instantly. Print detail or summary quotes for customer, office. *Can produce quotes with one keystroke. *Print detail or summary quotes for customer, office. *Save quotes to customer file for recall later. *You can load new job files (standard .dbf type files) for different types of services or products. New addictive arcade flash colorful game for all ages and tastes. Quicknote is a useful desktop-notepad that can also remind you. A free quick launch menu for files, documents and folders in your usb disk. Bug tracking with configurable fields, workflow, views, queries and access. Fast, highly optimized implementation of 7 symmetric encryption algorithms. Qweas is providing links to B&B Quick Quote 2.12 as a courtesy, and makes no representations regarding B&B Quick Quote or any other applications or any information related thereto. Any questions, complaints or claims regarding this application B&B Quick Quote 2.12 must be directed to the appropriate software vendor. You may click the publisher link of B&B Quick Quote on the top of this page to get more details about the vendor.